Grab a seat – and a drink – and take in our scenic mountains, vibrant cities and charming beach towns from one of the relaxing rooftops or patios across our state. Whether you prefer hazy mountain peaks looming large in the distance, the lively buzz of a cityscape or the tranquility that comes with sitting waterfront sipping a festive cocktail, North Carolina has all of these spectacular views in spades. And what better way to soak in our state’s beautiful horizons than sitting in the catbird seat atop fancy hotels, saddled up to the bar on an ocean pier or under the stars in a tucked-away alley? 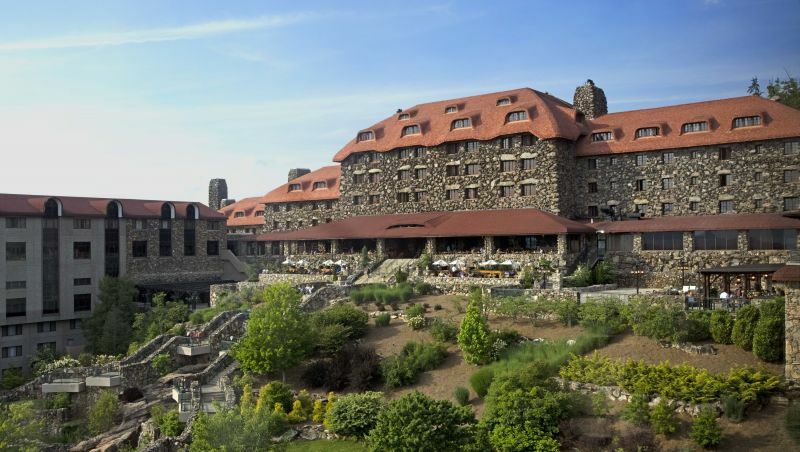 The Omni Grove Park Inn boasts luxurious rooms and multiple restaurants and is consistently recognized as one of the top resort spas in the world. Part of its international acclaim stems from the magnificent, wide-angle view of the Blue Ridge Mountains, best seen from the Sunset Terrace. This tiered, stone, outdoor haven paves the way for a sunset view that rivals Craggy Gardens and other famous sunset spots along the Blue Ridge Parkway. Plus, Grove Park doesn’t skimp on quality – anywhere – so expect premium cocktails, gourmet food and impeccable service. This Little Switzerland eatery lives up to its name, with a bird’s-eye view of the Blue Ridge Mountains. But 25-years-strong chef Todd doesn’t rely on just the striking views to lure in guests. He prides himself on delivering fabulous cuisine worthy of the dramatic setting. Start with the famous “Best Ever Oysters,” then choose between a crab cake atop a pretzel bun or North Carolina rainbow trout, a local favorite. Like spice? Go for the Angry Shrimp, sautéed with Serrano peppers, or Cajun-ize any seafood pasta dish for 75 cents. 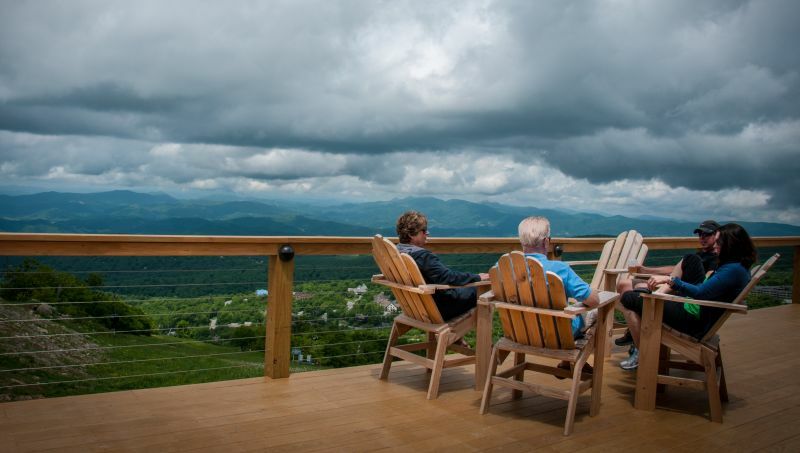 As the highest town on the East Coast, the circular 5506’ Skybar provides a 360-degree view of not one, not two, but three states on clear days. Best enjoyed during the winter months as a ski-in, ski-out bar and taproom, Skybar also becomes a key focal point during fun-loving events like its annual ‘80s-inspired Retro Weekend. Summer months provide views of the area’s lovely golf courses, famous for rarely recording temperatures above 80 degrees. Looking for a chic night out? Hit the ultra-modern Capella on 9 at sunset – named one of the “Top Rooftop Bars Around the World” by U.S. News & World Report in 2018 – and allow your evening to spill into the night as you sip high-end cocktails in its swanky lounge. And the tapas menu, developed in part with the owner of Posana, another popular local restaurant, pairs wonderfully with both the sweeping views and posh vibe. 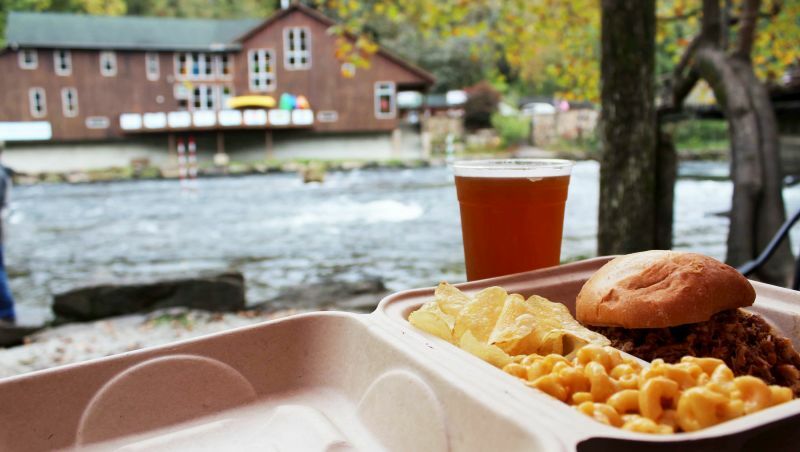 For those who like to live their life on the edge, you’ll dig Big Wesser’s large deck that sits on the banks of the Nantahala River as part of the Nantahala Outdoor Center’s campus, known for its whitewater rafting and zip lining. Parents will also dig the adjacent Treetop Adventure Nets, an elevated nets-based playground visible from Big Wesser. And on weekends, live music adds another level of fun to this adventure destination. 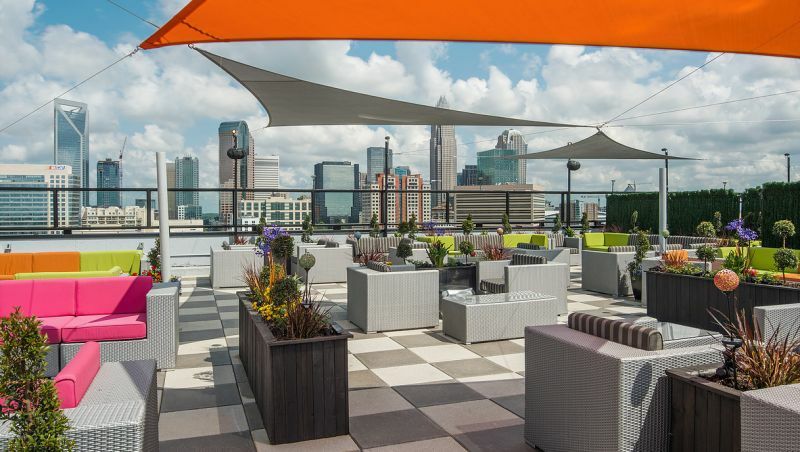 In the central region of the state, city lovers will enjoy the spectacular 360-degree skyline views from atop City Lights Rooftop. A great date night or girls’ night out spot, take in the twinkling lights of this bustling metropolis while sipping on its signature drink, the Sparkle & Pop. Choose between prosecco or sparkling rosé paired with a bevy of King of Pops popsicles options. 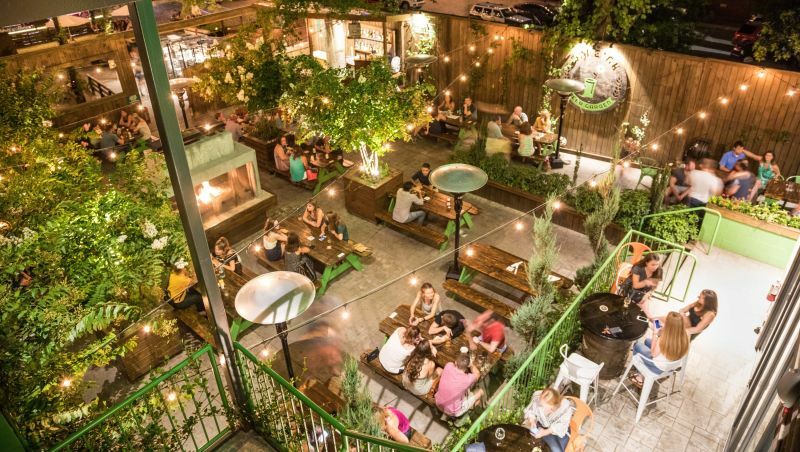 Take your pick between seating on the multileveled patio or the charming slice of alleyway with bistro tables underneath string lights at this beloved Winston-Salem haunt. Located in the Arts District, 6th and Vine features wines from around the world it matches with small plates of contemporary American cuisine like funky flatbreads, trendy entrees like avocado toast, and wine-infused dishes such as Cabernet ribeye or chicken marsala. 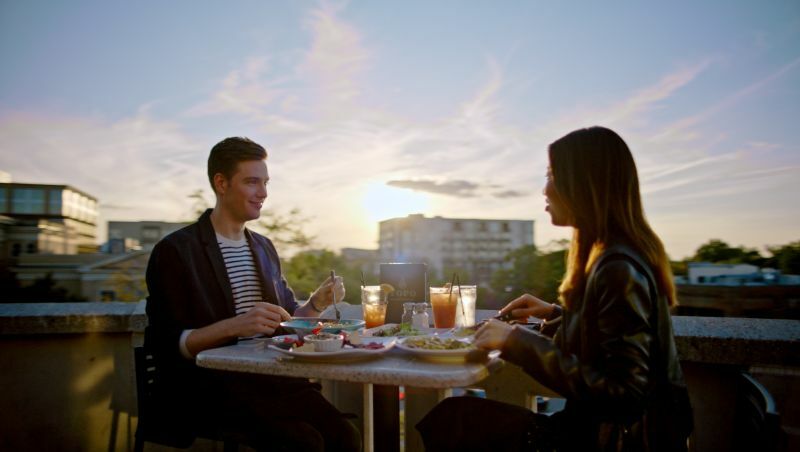 In the quintessential college town of Chapel Hill, TOPO attracts locals and visitors alike for its lovely covered outdoor patio that provides long-range views of the charming downtown below. TOPO also doubles as an organic distillery and a brewery, so enjoy a beer flight with a side of fresh air as you nibble on its locally sourced, Southern-inspired menu. More of a wine lover? Head to Yadkin Valley’s Shelton Vineyards and snag a table in its enclosed patio at Harvest Grill, named a top five “Best Winery Restaurant” by USA Today. Your experience starts with cruising through its fine gates and can end with a stroll around the property’s walking paths and ponds. In between soaking up the views, dine on seasonally inspired dishes like soup of the harvest, pork ossobuco or chili-dusted duck breast. Another feather in North Carolina’s cap is the Raleigh Beer Garden, Guinness World Record-holder since 2015 for offering “The Most Different Varieties of Beer On Tap” with more than 350 brews. But you’ll want to grab a roofless seat in the funky outdoor space chock full of interesting details that help create the fun, bring-the-outdoors-in atmosphere. Nothing screams ideal beachfront dining quite like a pier-located restaurant, and Fishheads Bar & Grill certainly delivers the goods. This laidback Outer Banks locale serves up breakfast, lunch and dinner with family-friendly options like all-beef hot dogs, conch fritters, and breaded seafood baskets paired with slaw and fries or potato salad. Watch fishermen cast their lines all day long, or check out the music calendar for a fun night out dangling over the Atlantic Ocean. Fun-loving Reel Cafe features four levels, including a rooftop bar overlooking Cape Fear River and a courtyard oyster bar that features live music in the heart of downtown Wilmington every Friday and Saturday. A happening nightlife spot with a dedicated late-night menu, Reel Cafe also offers brunch and house wines for just $5 a glass. This massive beach house-style dinery in Swansboro showcases not one, but two waterways from its outdoor deck: the Intracoastal waterway and the Bogue Sound. If the outdoor tables are all taken, never fear: Every single indoor table also provides waterfront views. Native chef Martin Berndt has been slinging classic American tidbits – alligator bites, she-crab soup, and heartier platters like bone-in pork chops and North Carolina-raised beef – for more than two decades. For another unique dining option, check out the Calabash-style seafood plated at Frying Pan. Named after the famous Frying Pan Tower, a former Coast Guard light station that’s considered one of the most dangerous hotels in the world, Frying Pan also hosts oyster roasts overlooking the Cape Fear River. Note: They close for the winter from mid-December to March. This high-end spot carries inventive choices such as braised lamb and housemade cornmeal gnocchi, green tail shrimp ramen and, of course, duck breast. Grab a drink at The backBAR while you wait for your table and relax in one of the Adirondack chairs overlooking the Currituck Sound. If you time it correctly, you can even catch a beautiful sunset that will start your night off right.